1. We went to see Godzilla - it was fun! Not only was it a blast to watch Godzilla fight the MUTOs but it made me fondly recall past holidays when my family would have an old Godzilla movie on TV as we made the holiday dinner. Somehow, my brother's VHS of the movie where Godzilla battles Mothra is in my possession. I just can't part with it. My brother has even introduced his son to holiday Godzilla viewings! Small garden covered with bed sheet the morning after a frost warning. 2. Of course after we moved all the plants outside there were frost warnings. Twice last weekend SP went out at 11:30 at night to cover the garden and petunias out front and then out onto the deck to bring the herb pots into the sunroom. Stupid cold weather. Thank goodness we have a bunch of old bed skirts and sheets - they seem to work well when plants need covering! 3. We added a new herb to our herb line up: tarragon. SP bought a plant at the Frick greenhouse yesterday and transplanted it last night. 4. It's Memorial Day weekend! That means it's summer. Right? 5. Whoo - the Brenchels didn't win Amazing Race! It was SO MUCH FUN to watch her dissolve in tears as they failed to win in their hometown of Las Vegas. I laughed so hard when she couldn't find the employee entrance at The Mirage when she used to work there! Hahahahaha! 6. We made a roast chicken this week. We haven't done that in quite some time. We used the last bag of stuffing cubes (I bought too many bags of stuffing cubes last Thanksgiving) to make sausage~mushroom stuffing and steamed some broccoli to go with it. Yum! The chicken was seasoned with sauteed onions, lemon, salt, and parsley. 7. 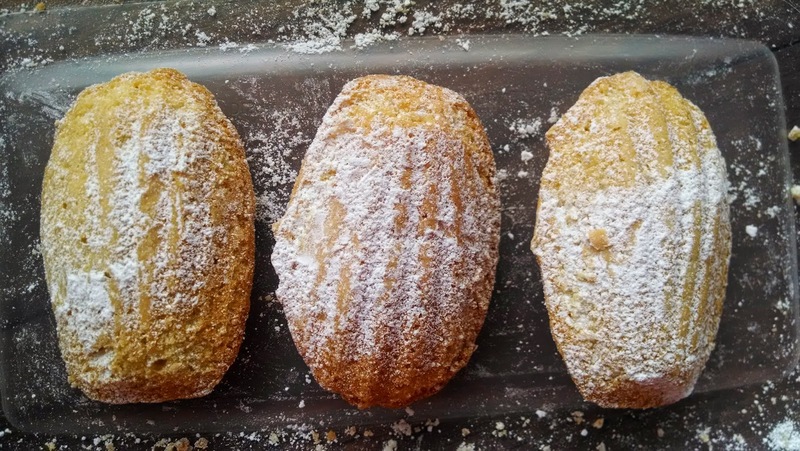 Dessert this week is madeleines. It's been a long time since we baked these. This was one of the better results since I managed to get them out just as they were starting to brown so they stayed moist. I'm glad that we can make such delicious, mouth-watering desserts, but on the other hand, when I have will power problems and eat 5 cookies at once, maybe it's not so good. 8. Hope you have a great holiday weekend!